I recently received a request from a potential client for an image of Atlas that they might want to use in their lobby. The customer was looking for something that would ‘pop’. 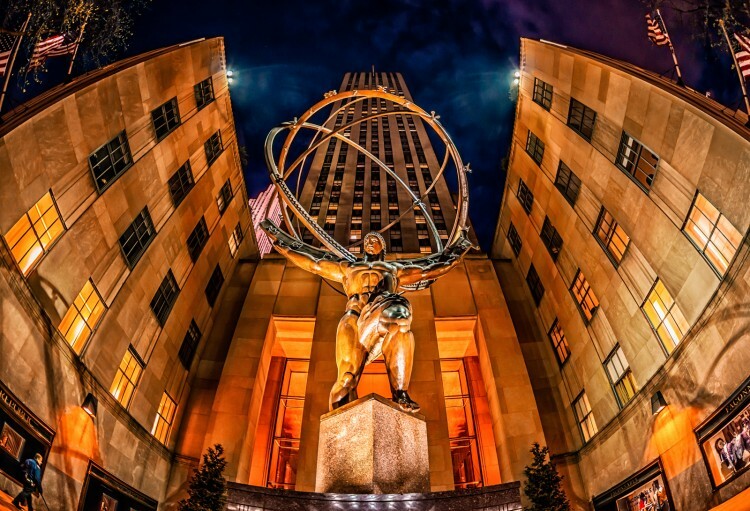 I had a few shots of the Atlas statue located in Rockefeller Center and I looked them over for one or more that might meet the client’s requirements. The main problem I was having is that most of the shots I took were taken at night which limited the color palette available. When looking over my catalog, I came across this image taken earlier in 2012 that I thought might have possibilities. 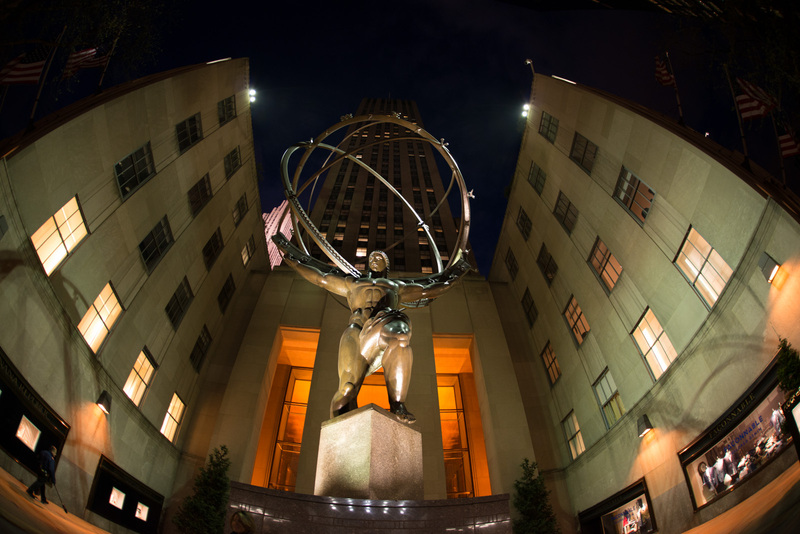 The shot was taken with my 15mm fisheye and I liked the way the walls of the building curved in and seemed to wrap around the globe that was being held by Atlas. I also like the general symmetry of the shot, including the American flags on the top of the building. However the raw image had several problems. The first problem I wanted to address was the horizon. The two sides of the building did not line up, so I used the cropping tool in Lightroom to rotate the image so that they would line up. I did some further tweaking in Lightroom, including punching the clarity, playing with the overall exposure and adjusting the highlights, etc. My goal was to add a bit more punch to the image. I was able to get pretty far in Lightroom, but I wanted to take it further. I proceeded to open the image in Photoshop and use a combination of several filters from onOne’s Perfect Effects to punch up the reds and add some more detail to the stone work and statue. I also corrected a greenish color cast which I didn’t like. I cloned out a security camera in the upper right and made a minor crop to improve the symmetry of the image. I just love what can be done in Perfect Effects. You have really made this image pop, James! I was amazed at what I was able to get out of this image. I do think it helped that I was starting with a very large raw file from the D800, but I do love the tools included with Perfect Effects. It’s funny how you come across cool things while searching for something else . . I was doing a search for “stretcher frames ann arbor,” because we just moved here and looking for a local retail source. Your “Graffiti Alley” popped up in the google search, and I have spent the last half hour exploring your amazing photo images. I had to stop and comment here because this image is really stunning. I grew up in New York and still know it as one of the most photogenic places on earth! Love the fisheye effect. Are your images available locally? Where can we see your work? Thanks for stopping by and checking out my work. I definitely agree with you that New York is very photogenic, I’d like to visit more often! As far as where you can see my work, I don’t have anything locally, but I do have a couple of online galleries at http://jameshowephotography.imagekind.com and http:fineart.jameshowephotography.com. I haven’t been posting to my blog as often as I should, but I do post frequently to Google Plus at https://plus.google.com/114480451015846480694/posts. Always love to hear feedback!